The financial giant’s shareholder meeting will draw protesters on the outside—and disgruntled investors on the inside. 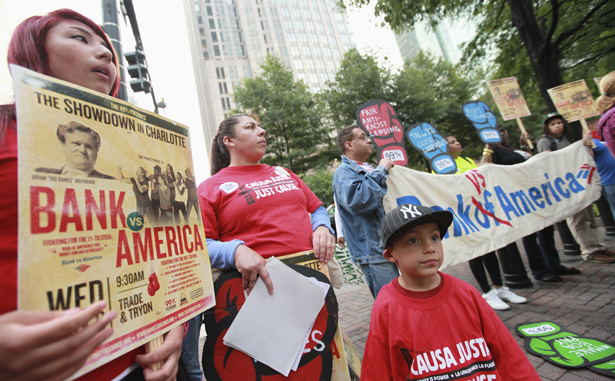 A lot of the people who will be gathering in Charlotte today for Bank of America’s annual shareholders meeting have been robbed of their fortunes, their hopes and their dreams. Tensions will run high as they air their grievances and issue their demands. Demonstrators? I’m talking about the shareholders. Bank of America labors under the dual burden of being both ethically challenged and incompetently managed, so everybody will have a beef today. While the Occupy movement has pledged to behave courteously and peacefully in Charlotte, a town some call the “Wall Street of the South,” BofA shareholders have made no such promises. They’ve seen the share price fall from its 2006 high of $52 to less than $8 today, and they know that the executives facing them tomorrow would have destroyed the bank completely if the government hadn’t intervened. The meeting should be interesting. (I’m holding a proxy letter from an investor with more than 80,000 shares.) Large institutional investors have been surprisingly feisty lately, rejecting Citigroup’s executive pay plan and calling for the ouster of an especially objectionable Goldman Sachs Board member. Will BofA’s investors revolt too? Insiders say no; they might. They should. If the action out in the street the action gets intense, the authorities may well be the the ones at fault. In what many observers consider a dry run for this summer’s Democratic convention, the city has decided that constitutional protections end at the city limits. It has outlawed camping, reserves the right to search private property like backpacks, briefcases and duffel bags, and has banned a long list of common objects. The logic behind banning items like hammers seems obvious enough. (I’d hammer in the morning, I’d hammer in the evening … I can see how that might get annoying.) But the banning of spray paint, non-soluble liquids, utility knives and etching materials look more like a preemptive attempt to outlaw speech. From a constitutional point of view, the most illegal item on the streets of Charlotte tomorrow may well be the list itself. City officials say these extraordinary—and extrajudicial—measures are designed to prevent criminal behavior before it happens. But it’s unlikely that anyone in Charlotte has a longer rap sheet that Bank of America. It’s already paid out hundreds of millions of dollars to settle charges that include forgery, perjury, and tax evasion related to foreclosure fraud. In some of its many other legal troubles, investors and the SEC are suing the BofA Board over alleged securities fraud in its acquisition of Merrill Lynch. Last week the bank said it had plans to “help 200,000 homeowners” (as headlines put it) as part of the massive (and widely criticized) five-bank foreclosure fraud settlement. That sounds good—but the bank was charged with contempt of court in Arizona for failing to abide by a previous deal, and a whistleblower has said it repeatedly defrauded the HAMP program for distressed homeowners. Investor fraud is committed whenever executives at a publicly traded corporation make false or misleading statements to investors of fail to disclose material facts. It’s also illegal to make false statements under Sarbanes-Oxley, which requires CEOs and CFOs to state that they’ve personally reviewed the corporation’s risk management and fraud prevention efforts and found them adequate. The city of Charlotte will not pre-emptively suspend civil liberties for bank executives, according to reports, nor is it considering any other extraordinary measures to prevent further criminal activity on Wednesday. Richard (R.J.) EskowRichard (R.J.) Eskow is a former executive with experience in healthcare, benefits and risk management, finance, and information technology. He is a senior fellow with the Campaign for America's Future and hosts The Breakdown, which is broadcast on We Act Radio in Washington, DC.